Fantasie Arianne Full Cup Wired Bra is rated 5.0 out of 5 by 1. 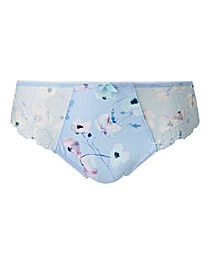 Arianne's graceful composition features powder blue base with a painterly floral print in soft lilac and mint tones. The look is finished with an overprinted Swiss designed embroidery and three-tone bow trim. Three-sectioned cup with side support for a great uplift and forward projection. Wide wired for additional comfort and support, fully adjustable shoulder straps. 80% Polyester, 14% Elastane, 6% Polyamide.